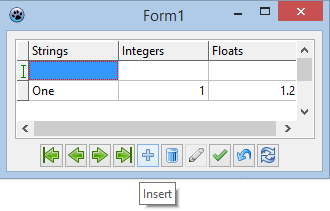 make use of the inbuilt validation whereby, for example, digits only are allowed in an integer field. Writing your own code to achieve all of the above with a file of records and a string grid would take much longer. Also, many of the steps required will be useful when accessing databases. Save the project as MemDatasetDemo1 and the unit as uMemDatasetDemo1. Drop onto the form a TMemDataset and TDataSource (Data Access tab) and a TDBNavigator and TDBGrid (Data Controls tab). In the Object Inspector, right-click on MemDataset1 and select menu item Create dataset. This step does not provide you with the opportunity to enter some data as it does in Delphi's TClientDateset and it might not be necessary in Lazarus, but it does no harm. Click in the FieldDefs edit box then on the ellipsis icon to bring up the FieldDefs editor. Click on the + icon to add a FieldDef and change its data type to ftString, its name to Strings and its size to 10. In the Object Inspector, select MemDataset1 for the Dataset property of DataSource1. MemDataset1 is, of course, the only dataset in the drop-down list. Similarly, set the DataSource property of DBGrid1 to DataSource1. Set the width of DBGrid1 to be 300 and suitably position it and the other visible component, DBNavigator1. Select the DataSource property of DBNavigator1 to be DataSource1. Type in the data Four, 4 and 4.5 then click in another row or on the Post (tick) icon to store the changes. Close the application then execute it again. The second demo (on the next page) requires the same kind of set-up and has a labelled edit box to contain search data and a button to execute the search. It transfers the initial (real world) data from arrays to the dataset.